The web is on fire today with Google announcing their Nexus One Google Phone. Google is positioning themselves in every way possible to dominate the mobile web. 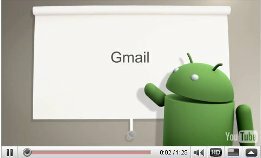 Right along with the announcement of Nexus One, we are now seeing Google launch tutorials on how to use Google products on the Nexus One such as Gmail. Quick contact badge: Press the contact status icon within Gmail, and a handy box shows all of the ways you can reply to a contact — including email, chat, SMS, and Facebook. Voice input: Swipe the keyboard, then just speak to select contacts or write an email, complete with punctuation. Period! Multiple Gmail accounts: Sync multiple accounts to the same device and switch between them without leaving the app. Undo: A handy ‘undo’ link makes it easier to retrieve messages when you hit archive or delete by mistake. (Note: you can’t yet undo send as you can with the desktop version of Gmail). is this real push email? does it work really push like bb or not?